GOP should be careful what it wishes for with the fed. 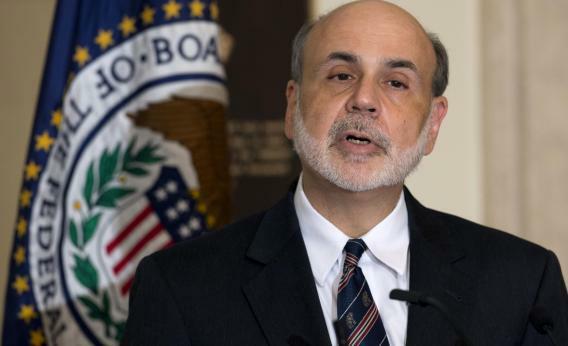 Fed Chairman Ben Bernanke’s alleged sins have yet to materialize. “Bye bye Bernanke,” and variations thereof, has become a popular rallying cry at this week’s Republican convention. It’s a good sound-bite, but it comes over as an attack on the U.S. Federal Reserve’s cherished independence. A more constructive tactic would be to outline how the party thinks the central bank should be constrained. After all, Fed Chairman Ben Bernanke’s alleged sins have yet to materialize. Critics say his aggressive rescue during the financial crisis and aftermath went too far and is a recipe for inflation and a weak dollar. However, in the almost four years since markets collapsed and the Fed sprang into action, the nation has experienced nothing like runaway prices. And the greenback has strengthened against the euro and other currencies. The Fed chair is a disciple of Milton Friedman, the University of Chicago economist who founded monetarism - the same technocratic discipline followed by Bernanke’s predecessor and Ayn Rand devotee Alan Greenspan. Considering that Republican presidents George W. Bush and Ronald Reagan respectively nominated both, the GOP’s current anti-Fed sentiment is ironic. It does, however, reflect a shift within the party towards the Austrian school of economics, which essentially argues for taking power away from central bankers, accusing them of making more mischief than magic. This explains the party platform’s adoption of a demand for a Fed audit and its humoring of a possible return to the gold standard. But Republicans aren’t Austrians quite yet - and probably never will be. The logistics and politics behind such dramatic reforms are exceptionally complex. As a compromise, though, the right could embrace a more mechanical approach to monetary policy. That could include, for example, relying on the Taylor Rule, an equation developed by possible Bernanke replacement John Taylor that predicts the optimal interest rate based on inflation and output to calibrate money supply. This wouldn’t be perfect. It would limit the Fed’s flexibility to proactively manage crises. It would also still rely on the projections of economists to execute policy, leaving considerable room for human error. Narrowing the Fed’s mandate to price stability and shedding pursuit of full employment could partially remedy this problem. Mitt Romney and his party show little love for Bernanke, favoring a more hands-off approach to monetary policy. But they need to be careful what they wish for: a Fed chief who lacks Bernanke’s creativity might botch the exit from the huge fixed-income portfolio the central bank built up in response to the crisis. That would bring the very runaway inflation that Republicans hope to avoid.